The Opening Dialogue: Identifying the Holy Elephant in the Counseling Room. Onedera, Greenwalt, Introduction to Religion and Marriage and Family Counseling: Religiosity versus Spirituality. Worthington, Hook, Wade, Miller, Sharp, The Effects of a Therapist’s Religion on the Marriage Therapist and Marriage Counseling. 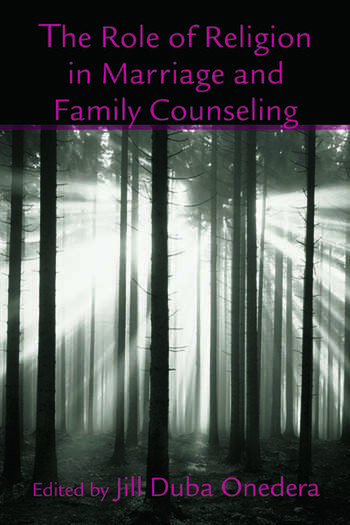 Religious Context within Marriage and Family Counseling. Onedera, The Practice of Marriage and Family Counseling and Catholicism. Zink, The Practice of Marriage and Family Counseling and Conservative Christianity. Cook, The Practice of Marriage and Family Counseling and Liberal Christianity. Altareb, The Practice of Marriage and Family Counseling and Islam. Shaneman, The Practice of Marriage and Family Counseling and Buddhism. Madathil, Sandhu, The Practice of Marriage and Family Counseling and Hinduism. Dorff, The Practice of Marriage and Family Counseling and Judaism. Bruyere, The Practice of Marriage and Family Counseling and Native Religions. Koepsell, Mercurio-Riley, The Practice of Marriage and Family Counseling and Humanism. Religion and Relationships. Centore, Clinton, Benefits of Religion on Recovery From Relationship Problems. Holeman, The Role of Forgiveness in Religious Life and Within Marriage and Family Relationships. Lara, Onedera, Inter-religion Marriages. Religion and the Counselor. Deaner, Pechersky, McFadden, Ethnicity: Religious Practice and Marriage and Family Counseling Implications. Onedera, Minatrea, Kindsvatter, Collaboration Between Licensed Mental Health Professionals and Religious Leaders. Onedera, Incorporating Religion Within Marriage and Family Counseling Programs. Jill D. Onedera, Ph.D., MFT, is a counselor educator at Western Kentucky University, in the Department of Counseling and Student Affairs, in the Marriage and Family track, and Marriage and Family Therapy Associate, Life Skills Inc.